Creek front home - out of the flood plain - in a highly sought after area. The very motivated sellers are offering an extremely well built, well maintained home at an incredible price. The "Double Bridge" area has a pulse. There are full time residents, new construction and vacation rentals all tucked away along the bends in Sylamore Creek. House is 1/2 mile down county graded gravel road. Sylamore Creek is an emerald jewel. Completely spring fed and running year round, it hosts some trophy small mouth bass fishing and trout run up it winter through spring from the White River. As it is rather undiscovered, not many float it; but what a treat it is to kayak, canoe or bank fish this creek. Lovingly built with full attention to detail; custom cabinetry, craftsman decking, earthquake specification build, soapstone wood burning stove, creative storage areas, enormous family room, artistic stone and tile and natural light throughout. Appliances and HVAC are higher end (1-2 years old). Roof is one year old with a 24 year warranty remaining. The lower level with separate entrance has its own kitchen, bath and 2 bonus rooms. Would make a great rental, home business or In-Law Unit. Almost two acres, the land has a park like feel. 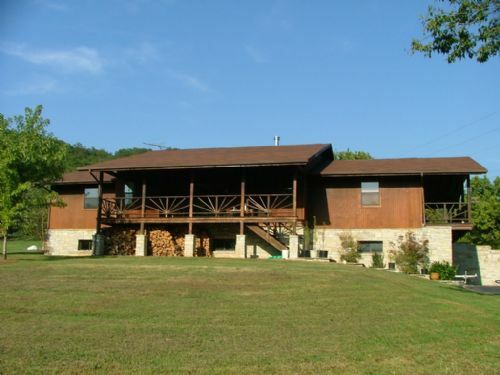 Creek frontage is 135' +- and there is an awesome swimming hole directly on the property. Behind the home's property line is a large grazing pasture with a couple of horses. All of this a mere 7 minutes from the town square.